All of Year 3 have been learning to play the descant recorder and invited their families to school on Monday 18th July to watch them play. We played 3 different pieces that we had learned-Hands, feet, heart; Down by the station and Hot Cross Buns. We have learned to play from staff notation, play along with backing tracks and begin to improvise using 4 notes. We hope that you enjoyed the performance. We've had a letter from the Queen!!! We are really excited this morning as we received a very special letter !!!! On Friday 8th July. Forty eight children from Chilcote school represented the school in 6 different Birmingham wide finals. The events were: Cricket, Tag-rugby, Tennis, Golf, Mega fest rugby and Rounders. 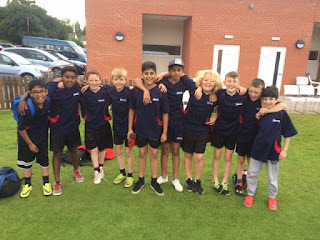 The Cricket team were unbeaten in the group stages and got into the final. Unfortunately, they lost the final by only 3 runs. This did mean they finished second in Birmingham though, so an excellent achievement! The Tag-rugby team did exceptionally well. They only lost one game all day and managed to finish as Birmingham wide champions!!! The Tennis team only missed out on getting into the final by 2 points having drew 2v2 with the other unbeaten school. They won their other four group games. In their third and fourth place play-off they lost 3v1 in four very close games of tennis. This meant that they finished in fourth place in Birmingham, which is a great result! The golf children had a thoroughly enjoyable day and managed to finish in sixth place out of eleven schools, so did really well. The mega-fest event was a non-competitive event but all of the children represented the school excellently in the different games and activities that they had to do. The rounders children played really well in their group games and won two and lost two of their games. This meant they qualified for the fifth and sixth place play-off. Unfortunately due to time constraints they didn't get to play that game so finished in sixth place, which yet again is a really good achievement! Well done to all of the children involved in today's events. Every single child has done Chilcote proud with their ability, dedication, motivation, respect and behaviour!!! Teddy Bears' Picnic in Early Years! 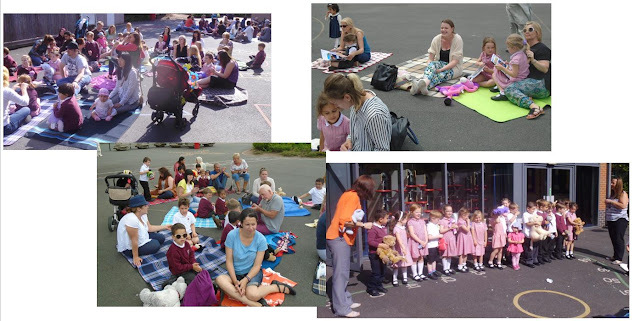 We had so much fun on Wednesday at our Teddy Bears' Picnic! The sun was shining and we were joined by our grown ups and our favourite teddies. We enjoyed lovely snacks and sang beautifully for our special guests. The best part of our picnic was sharing our Sparkle Books with our grown ups; it was wonderful to look back on all of the special memories we'd made during our time in Reception! Our teachers are so proud of our excellent achievements throughout the year! 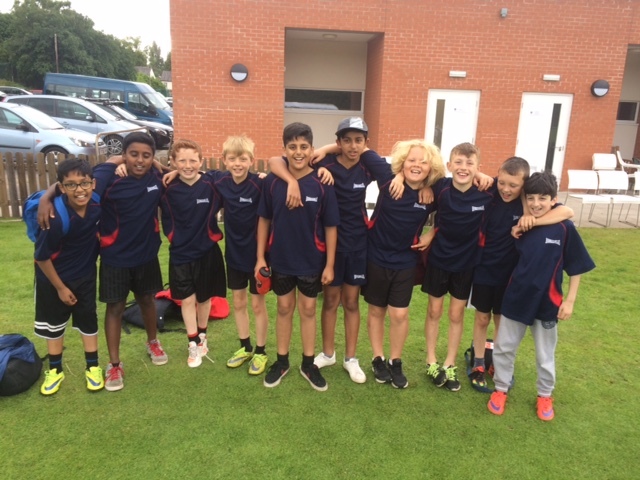 On Friday 1st July ten children from Chilcote represented the school in a County Cricket Final held at The Edgbaston Foundation ground. They qualified for this after winning the local area competition. The tournament was split into two groups. Everybody played each other once. Then, the team that finished first in each group would play each other in the final and the other teams would play the team who finished in the same position as them in each group. Chilcote started by playing against St Bernard's school. They batted first and gave away some sloppy wickets to finish on 225. St Bernard's replied with 251, so won the game. Next, Chilcote played against Park Hill School and again batted first. This time they cut out the mistakes and scored an impressive 256. Park Hill replied with 240, which meant that Chilcote had won. After that, Chilcote played against Little Sutton, who had won their previous two games. Chilcote put in the performance of their lives and batted superbly to get to a total of 247. They then bowled brilliantly and kept Little Sutton's score to 238. This meant that Chilcote needed to win against St Bernard's (a repeated fixture due to their being one less team in the group). Yet again Chilcote batted sloppily and gave away 6 wickets. They closed on 221. However, unlike in the first game they bowled amazingly well and took 8 wickets off St Bernard's meaning they only scored 211. Another Chilcote win. This meant that Chilcote had won 3 and lost 1 the same as Little Sutton. So, the officials looked at the total number of wickets taken in the group stage. Chilcote had taken 21 wickets and Little Sutton had taken 23. This meant the boys finished in 2nd in the group. Finally, Chilcote played in the 3rd and 4th place play-off. They played against Four Oaks school. They bowled first and kept the Four Oaks score to 224. Chilcote replied with an impressive 259, meaning they finished in third place in the tournament. Little Sutton went on to win the tournament and the Chilcote team were left thinking about what might have been. . .
Well done to all of the boys involved a third place finish in this high caliber event is very impressive! A great performance by all!! !